While outspoken and sometimes controversial, Trevor Gumbi is a firm favourite in the corporate market, where he can be found entertaining executives and their staff with tailored material, proving that he has the ability to adapt rapidly and appropriately for diverse audiences. Trevor Gumbi has had people laughing at several major comedy events in the country, including performing at Oppikoppi, Rocking the daisies, King-size comedy jams, Blacks Only, Laugh out Loud and Arts Alive comedy festival. He has voice over experience on Etv's animated series, Jozi Zoo, can be heard doing skits on 5fm as "The black guy at a braai" and enjoyed success staring on his TV skit show for the Vodacom Super 14 rugby season as Offside Vilakazi on "The desk with Offside Vilakazi" and was seen weekly on SABC 1 celebrity entertainment show “The Real Goboza”. Trevor Gumbi is the head writer on Mzansi Magics’ hit television show “Headline”, presented by Kuli Roberts every Thursday at 19h30. he is also a senior script writer on SABC 3’s political satire talk show called Last Say on Sunday and is the star of Vodacom’s Brother Ubuntu campaign. 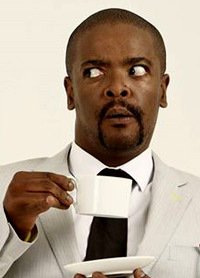 Trevor Gumbi can currently be seen performing stand-up comedy on comedy club stages countrywide. Needing more Corporate Entertainment we have South Africa`s TOP Artists.